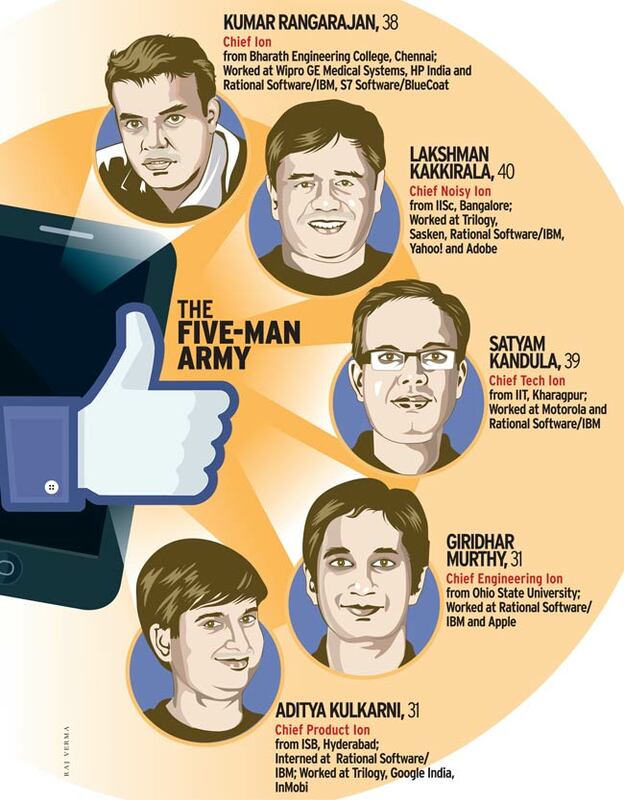 Five Bangalore techies with oodles of chutzpah sell their company, Little Eye Labs, to Facebook. Most companies have CEOs or managing directors. Not Bangalore-based mobile technology company Little Eye Labs. Its founders call themselves 'ions', short for 'eye-ons'. So, you have a Chief Ion, a Chief Tech Ion, a Chief Noisy Ion, a Chief Engineering Ion and a Chief Product Ion. Last month, the five ions were extremely charged - and it wasn't because of their quirky titles. Global social media giant Facebook had acquired the Indian start-up in a high-profile deal estimated at under $15 million. So, who are these ions? They are a motley group of entrepreneurs who got together while working at Rational Software/IBM long before they set up Little Eye Labs with seed funding from GSF India and VenturEast. None of them had any business experience - apart from Chief Ion Kumar Rangarajan, who had briefly flirted with entrepreneurship at the age of 14, when he and a friend started a local lending library. But they certainly had chutzpah. Plenty of it. It all began when Giridhar Murthy, a techie in his late 20s, was bitten by the entrepreneurial bug four years ago, when IBM was reportedly toying with the idea of exiting Purify, a memory debugger program used by software developers. Murthy was tempted to make a bid along with friends, but realised it would not work. He shot off a mail to two techie friends, Rangarajan and Lakshman Kakkirala, suggesting they take a shot at entrepreneurship. The trio in turn involved another friend, Satyam Kandula, an engineer with an IIT degree, and discussed the idea for two years. 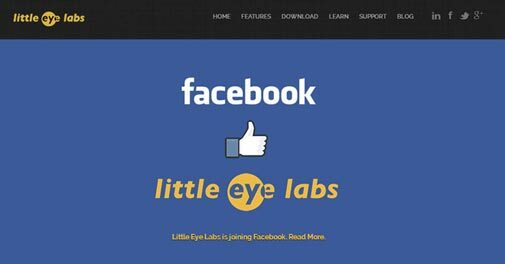 Later, they roped in another former colleague, Aditya Kulkarni, an engineer with an MBA, and the group was now ready to go: Little Eye Labs was finally born in Bangalore in August 2012. The firm was born out of a simple idea based on five things that irritate most mobile users: apps that drain battery energy; hanging handsets; apps that eat up a lot of data; apps that respond slowly; and the significant disc space apps occupy. An app developer might not know how much disc space or battery energy an app is going to consume. And this is the market the start-up served: it created tools to measure, analyse and optimise the Android code. The five men had developed similar tools for desktop products during their years at IBM. They wanted to leverage their knowledge and skills, and extend them to the mobile platform. In the initial days, Rangarajan worked out of CafÃ© Coffee Day outlets in Bangalore trying to understand the Android programme and write code for the proposed tools. "When we spotted them, they were working with the idea of measuring power. Our team helped broad-base the idea," says Rajesh Sawhney, founder, GSF India. So, Kandula became Chief Tech Ion, Murthy Chief Engineering Ion, Kulkarni Chief Product Ion and Kakkirala Chief Noisy Ion as he enjoyed interacting with customers. The start-up received a further dose of energy when Gaurav Lochan joined as Big Coder Ion, Satheesh Anbalagan as Chief Customer Ion and Srikant Sahay as Coder Ion. Lochan earlier worked with Flipkart, where he used Little Eye tools for the online retailer's Android apps, but he would come up with so many feature requests he decided to join the team to create them himself. By November 2013, the company had about 2,000 users and 25 paying customers, including GE Medical Systems, Qualcomm and Intel. Around this time, the start-up raised seed funding of Rs 1.5 crore from GSF India and VenturEast. The investors saw big potential in Little Eye's products. "Tools for app developers is a multi-billion dollar market opportunity," says Sateesh Andra, Managing Partner, VenturEast Tenet Fund. Sawhney was hopeful too. "We knew Facebook or Google kind of companies would be interested in this company. But we were ready to back the company even if the Facebook deal had not happened," he says. Little Eye's first contact with Facebook was in May 2013 when its representatives attended a Google conference in San Francisco. The Indian start-up's founders pitched their tools to the Silicon Valley giant, which showed interest and evaluated the product. The two teams began discussions - and in the end, the Facebook management negotiated a price not for Little Eye's product, but the company itself. Why did the company take up Facebook's offer? According to Sawhney, the founders probably thought it would help their product reach millions of mobile developers in a short period. "This is one deal with the best outcome where everyone - Facebook, investors, employees and founders - is happy." Industry experts say Facebook's offer was a big endorsement of the company's product. "While from Facebook's perspective, it could be a small step to look at the Indian market for acquisitions, from the Indian start-up ecosystem's perspective, it's a giant step," says Praveen Bhadada, Director (Market Expansion) at Zinnov, a consulting firm. Analysts say the acquisition makes business sense for Facebook. The social network giant will save time, money and energy on developing similar tools to plug any gap in its own portfolio. Facebook, analysts say, is aggressively working on its mobile strategy - a good chunk of its recent revenue came from mobiles. The Nasdaq-listed social networking site with a market cap of $143 billion wants to ensure its app quality is continuously improving. "The Little Eye Labs technology will help us to continue improving our Android codebase to make more efficient, higher-performing apps," wrote Facebook Engineering Manager Subbu Subramanian on the Facebook timeline. Little Eye founders and Facebook declined to comment on the deal. It is a win-win for everybody. The Facebook deal has also been a windfall for GSF India and VenturEast Tenet Fund. "In one year of our investment, we have had double-digit returns. Our returns are higher because we came on board first," says Sawhney of GSF India. VenturEast's Andra says they have got "multiple x" returns. "We are exiting eight months after our investment. Usually we expect exits in five years or sometimes even more. This is an exception." The Little Eye team will move to Facebook's headquarters in Menlo Park, California. 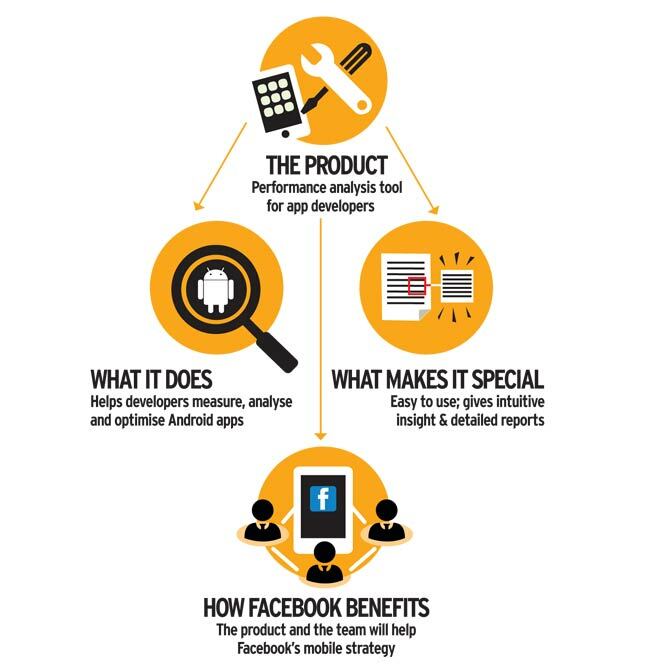 "From there, we'll be able to leverage Facebook's world-class infrastructure and help improve performance of their already awesome apps," Rangarajan wrote on his blog. "For us, this is an opportunity to make an impact on the more than one billion people who use Facebook."